Located only 19 miles north of Kathmandu, Langtang Trek is closest you could get to massive snow capped mountains and glaciers. Mt. 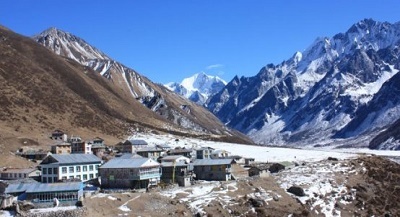 Langtang Lirung (7246m) dominates this valley. 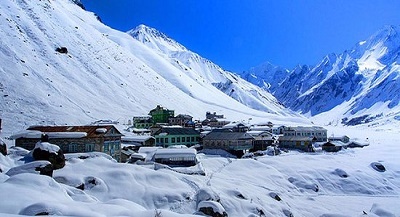 Still unspoiled this Langtang Valley Trek offers varieties of rhododendron, bamboo forests, majestic waterfalls, rugged rock and snow-capped peaks, grassy down, meadow, variety of wildlife along with wide range of cultural tradition with ancient ethnic tribes Tamangs, Yolmus and Bhotias who follow Buddhism. Langtang Trek starts with a day’s bus ride from Kathmandu to Syabru Besi. We follow the trail along the river to Lama Hotel and through rhodendron and pine forest we reach Langtang village inhabited by local ethnic groups. We climb up further to Kyanjin Gompa which is surrounded by the Himalayas all around. You can enjoy the panoramic views, glaciers, icefalls, birds and yaks. On the way you also pass by water mills, monasteries,prayer wheels, chortens, with sacred mounds of rocks with inscriptions carved on them. Then we visit to Kyanjin RI for mountain sunrise views and head back to Lama Hotel, Syaru Besi and drive back to Kathmandu. Langtang region is also enriched with wildlife such as Himalayan black bear, Snow Leapard, Himalayan Thar, jackel and 30-40 species of birds along with elusive Red Panda. Best seasons for this trek are autumn (Sept. to Dec.) and Spring(March to May). Day 04: Trek to Lama Hotel(2500m) 6 hours. Day 05: Trek to Langtang valley( 3307m) 6 hours. Day 06: Trek to Kyanjin Gompa(3798 meters) 5 hours. Day 08: Trek return back to Lama Hotel (2500 meters) 5.30 hours. After an early morning breakfast we drive on our way to Syabru Bensi via Trishuli. We will have a lunch at Trishuli. After we reach to Syabru Bensi we will rest at hotel and get ready for the trekking tomorrow. After having morning breakfast at Syabru Bensi we begin our hike to Lama hotel. On the way we can catch a mesmerizing view at the places. We pass through the dense forests with a spectacular views of mountains on the way to Lama hotel. We descend from Thulo Syabru to Pahiro where we will have a lunch. After that we ascend and reach at Lama hotel. Overnight a Lama Hotel. After having morning breakfast we begin our trek to Langtang valley. On the way we see the mesmerizing rivers and rivulets, a pure nature with a pure astounding beauty of the mountains as well as the ways. Onto the reach of Ghodatabela we will have a lunch there. The place is popular for horses as we can see the beautiful horses in Ghodatabela. After that we begin our trek again. We will reach Langtang valley after 2 hours of walk from Ghodatabela. Overnight at Langtang. After having morning breakfast we begin our way to Kyanjin Gompa. We can have a beautiful view of mountains like Langtang RI 1, Langtang RI 2, Langtang Summit, Dorje Lakpa, Gyansakan, Helambu etc. We can catch a mesmerizing view on the way where we can see colourful trees on the way as its filled with greenary as well as like a rainbow. After walking for 5 hours we will reach Kyanjin. Overnight at Kyanjin Gompa. Kyanjin Gompa is a beautiful place with a mesmerizing view of mountains upfront. We can watch the shining mountains infront of our eyes. We can have a beautiful view of Langtang Lirung, Langtang Summit, Dorje Lakpa, Naya Khang and many other mountains. If you want to have a panoramic view of mountains with a sunrise then we walk early to Kyanjin Ri for 2 hours then after that we can have a mesmerizing view of mountains uptop from the Kyanjin Ri which is the valley uptop from Kyanjin Gompa. Then we descend to Kyanjin Gompa and spend our day over there resting. Overnight at Kyanjin Gompa. After having breakfast we return to Lama hotel today following the same track we came before. We will have lunch at Ghodetabela. Then we reach at Lamahotel. Overnight at Lama hotel. Today we walk the same way we came through the first time. We reach the destination at Syabru Bensi. Overnight at hotel. After an early morning breakfast we drive on our way to Kathmanu via Trishuli. We will have a lunch at Trishuli. After we reach to Kathmandu we will rest at hotel.